The Yankees and Kansas City Royals just got out of 59-minute rain delay and at least a portion of the infield may be a little soggier than usual. 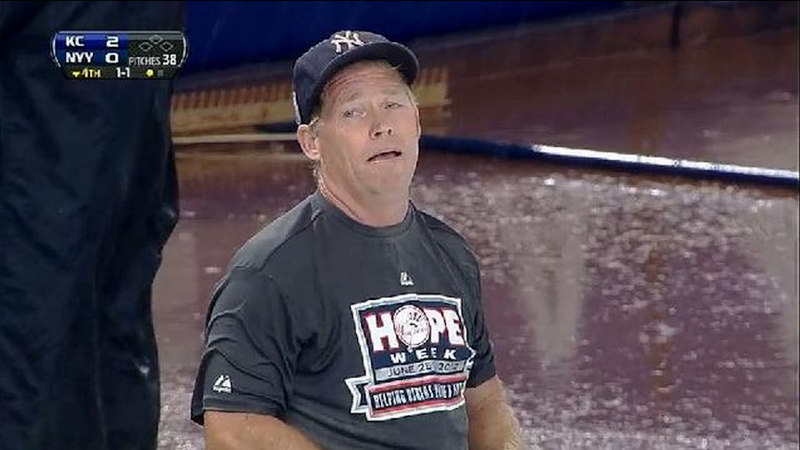 The sky flooded the Bronx and the Yankees grounds crew could not get the tarp fully over the infield before it became too heavy with rain water to move. There is a lot of futile pulling, a lot of good-meaning-but-ultimately useless assistance from khaki-wearing guys and a lot of panting from the Mantlesque head groundskeeper, Danny Cunningham.